Lasers have been present in dentistry since 1994 to treat a number of dental problems as an alternative to more traditional treatment. A laser is pointed beam of light which works with defined wavelength and energy suitable for soft or hard tissues of an oral cavity. 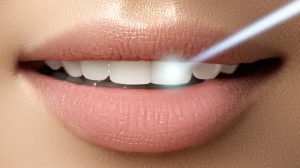 Different types of lasers are used in dentistry such as Diode, Er: YAG, Er, Cr: YSGG with a wide range of possibilities of their use in many dental procedures. What are the advantages of the use of dental laser? Tretmani laserom podrazumevaju intervencije koje zahtevaju minimalnu upotrebu anestetika, jer su intervencije manje bolne. Laser treatment reduces the need for anesthetics. When used in surgical procedures, there is little or none bleeding and minimal risk of wound infection because of the coagulation that happens at the same time as the performed procedure. Periodontal disease treatment – causal as well as surgical therapy of periodontium. Lasers have shown to be very successful in the removal of inflamed tissue, as well as bacteria causing periodontal disease. Esthetic procedures such as gingivectomy and clinical crown lengthening. For two-phase implantology treatment and for pre – prosthodontic preparation of implant. Disinfection of the implantation site in periimplantitis. In endodontics for the treatment of infected root canals. Tooth whitening is considered to be the most effective when done by laser. The procedure doesn’t last long and gives the best results. In the treatment of aphthae and oral herpes. Frenectomy and removal of smaller lesions in the oral cavity. Sensitive tooth neck. Laser treatment accelerates obliteration of dental tubules and disables transmission of stimuli, which relieves discomfort. Therapy of temporomandibular joint pain.